It's unlikely that many up-and-coming artists sell their first paintings before they're old enough to toast their success with a glass of champagne. Moraga's Bridgette Thornton did just that. But then, Thornton's incredible artistic talent is complemented by both her entrepreneurial spirit and her moxie. 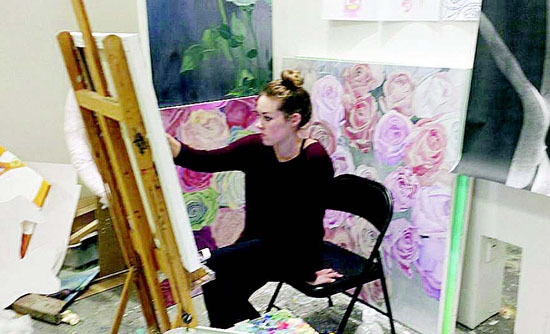 A recent graduate of California College of the Arts (CCA), the 23-year-old painter grew up in Moraga and credits the local public schools for both teaching her the art form and supporting her passion for it. "Camino Pablo was where I remember first being introduced to painting and drawing," Thornton said. "I was able to develop my love of art just by attending the public schools and taking the art classes they offered." A family trip to San Francisco's Museum of Modern Art solidified Thornton's passion. "I was completely taken in by the power of painting," she noted. Art classes at Joaquin Moraga Intermediate School and Campolindo High School helped perfect Thornton's abilities. Pre-college summer programs at CCA intensified her enthusiasm. Jill Langston, Campolindo's visual arts teacher and a role model for Thornton, strongly encouraged her. "Bridgette's work was outstanding; she always had a lot of initiative - she was open-minded with her own unique style and personal vision," Langston said. Art is what kept the very personable Thornton calm, particularly in high school. "Art is a great emotional outlet," she explained. "It's so relaxing, so therapeutic - especially when there are so many academic pressures on high school kids." When it came time to apply to colleges, Thornton was torn; she couldn't decide if she should attend a state school where she'd get both a good education and great social experience, or try for an art school to pursue the career she really wanted to have. With the encouragement of her parents and Langston, she chose CCA where, she said, the "art programs help you learn to apply these talents to real world experiences." 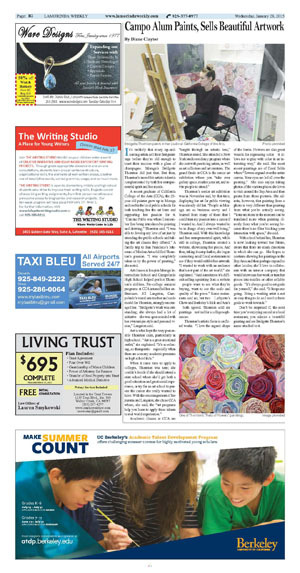 Academic classes at CCA are "taught through an artistic lens," Thornton stated. She attended a New York studio residency program where she met with practicing artists, as well as art collectors and art curators. The grand finale at CCA is the senior art exhibition where you "take over gallery space, market your art, and invite people to attend." Thornton's senior art exhibition was in November and, by that time, displaying her art for public viewing was already old hat. "People in Moraga are so business savvy and I learned from many of them that I could turn my passion into a career if I wanted to. And I always wanted to be in charge of my own well-being," Thornton said. With this knowledge and her entrepreneurial spirit, while still in college, Thornton created a website, showcasing her pieces. And then, taking it a step further, she began contacting small local restaurants to see if they would exhibit her artwork. "I wanted to work with an audience that's not part of the art world," she explained. "And sometimes it's difficult selling a painting from a website - people want to see what they're buying, want to see the scale and quality of the piece." Some restaurants said no, but two - Lafayette's Chow and Berkeley's Rick and Ann's - both agreed. Thornton sold six paintings - not bad for a college sophomore. Thornton's artistic focus is on floral works. "I love the organic shape of the forms. 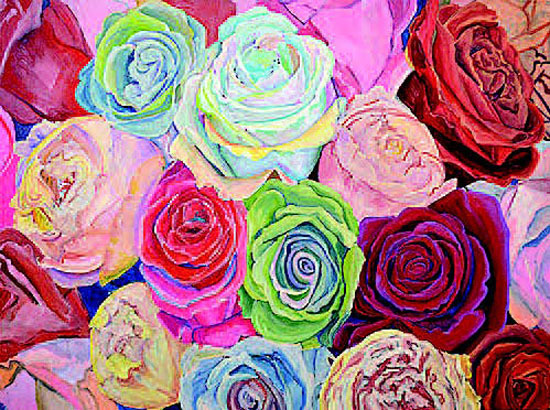 Flowers are also great vessels for expressing color - it allows me to play with color in an interesting way," she said. Her most recent paintings are of floral fields where "flowers expand over the entire canvas. Your eyes are led all over the painting." She also enjoys taking photos of the various places she loves to visit around the Bay Area and then paints from these pictures. She admits, however, that painting from a photo is very different than painting from what you're actually seeing. "Your emotions in the moment can be translated more when painting directly from what you're seeing because there's no filter blocking your interaction with space," she said. With school behind her, Thornton is now looking toward her future, aware that there are many directions in which she can go. She hopes to continue showing her paintings in the Bay Area and then perhaps expand to other locales; she'd love to collaborate with an interior company that would showcase her work or turn her pieces into textiles or other sellable goods. "It's always good to set goals for yourself," she said. "It keeps me going. Being a working artist is not an easy thing to do so I need to have goals to work towards." Don't be surprised if, the next time you're enjoying a meal at a local restaurant, you admire a beautiful painting and see Bridgette Thornton's name attached to it.